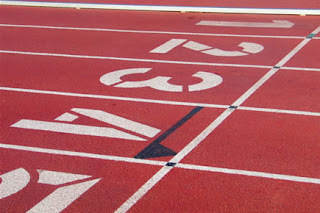 Today's track workout was mainly for pacing in preparation for my 5k in the morning. I felt really good during this workout except that my legs felt heavy at the beginning. I also felt like I was not breathing well on the last 1200. It was really hard to keep up the pace. I hit my splits fairly well, but I had to go hard on the last 400 of the 1200's to finish near the pace. On my last 400 I was behind a really fast runner that was cooling down. His cool down is faster than my race pace so I ended up doing it in 1:41. I know that my body is able to run fast for a 5k, but for some reason I tend to let up during the last mile. I am going to try to push through the pain and the desire to slow down and see how I do.